Welcome to North Texas, land of plenty and low unemployment, where we have nearly run out of exclamation points in describing the real estate market. And what about the economic fundamentals that drive the housing market? Those data points are hot, too. Dallas’ unemployment rate is less than 4 percent, a level many economists consider “full employment.” The area has been adding about 100,000 jobs annually. And more employers are headed this way. In Plano, Toyota North America is building a 2-million-square-foot campus on a 100-acre site while Liberty Mutual Insurance and JPMorgan Chase are coming to the $3 billion Legacy West development. In Richardson, State Farm and Raytheon are setting up in the $1.5 billion CityLine development. In Westlake, Charles Schwab Corporation is building a campus. In Southlake, TD Ameritrade is doing the same. From Midlothian in the south to Celina in the north, from Weatherford in the west to Terrell in the east, developers will start building nearly 30,000 new single-family homes this year, if current trends hold. In such an expansive area, there are more than enough vacant plots of land on which to put those homes. So maybe it seems weird for Jim Gaines to say that we’re bumping up against the physical limits of expansion. But he’s not talking about land that can be developed. He’s talking about land that’s ready for development—land served by sewer and gas lines. Land that’s connected by roads to surrounding communities. Land that’s ready for developers to buy and start digging up and building on. That kind of land is in surprisingly short supply, the way Gaines and his team of experts see things. North Texas cities can make more plots ready for developers if they want to, of course. But do they? Does rural Celina want to be the next Frisco? Does lakeside Rockwall want to become like the increasingly dense and commercial Plano? For that matter, do Plano and Frisco want to become even denser to answer the currently surging demand for affordable housing in the Dallas area? Realtors. (And, oh, by the way, that median price is $67,000 higher today than it was just five years ago.) Experts fret that too many of the new homes about to come to market are priced above what many middle-class Dallasites can afford. In Frisco, dirt will turn this summer at Brinkmann Ranch, a 3,500-acre parcel in the center of that suburban city. Shaddock Development will start work on 270 homes there this year, with another 230 to follow. But they won’t come cheap. Homes will start at $400,000. Metrostudy, a housing market analysis firm, says a third of all newly built houses in the Dallas area will be priced at more than $400,000. The company says most new builds will be priced from $250,000 to $400,000, but one of the fastest-growing categories is new homes priced at $750,000 and above. Construction starts on homes in that price range are up 30 percent since 2015. Buyers may be balking at that. Homes priced above the area median are slower to sell than those at or below the median, says Paige Shipp, regional director of Metrostudy. That’s not to suggest sellers can’t still get record-high prices. But it does indicate that a top of the market could now be in sight. Some even think that price declines are inevitable, given the underlying economic fundamentals of the market. Put another way: the homes for sale here are rising in price faster than incomes are rising. Fitch Ratings, a credit analysis firm, says that in the 42 consecutive months Dallas-area home prices have increased, income growth has failed to keep pace. In fact, it’s not even close. Over the past two years, as prices have surged by double digits, incomes here have grown just 3.3 percent. Fitch says the current market is actually overpriced by 10 to 15 percent. Arch Mortgage Insurance puts that number even higher, estimating Dallas homes to be 24 percent overvalued. It also puts Dallas in the top five for markets at risk of price declines. Houston, Austin, and San Antonio are among the others. Some other numbers can also tell the tale. 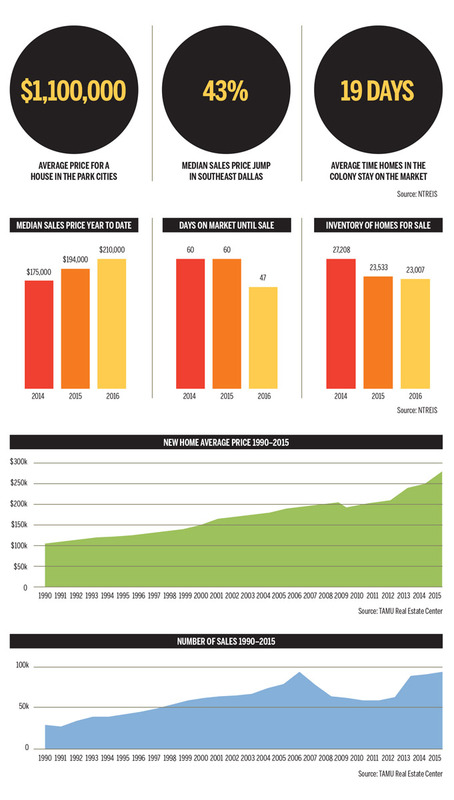 In 2010, the median income in Dallas was $58,025, and median home prices were $141,000. Today, median home price is $210,000, according to the National Association of Realtors. Median income is $61,600. Get out your scratch pad and you can do the math. It means that homes here now fetch a 3.4 times multiple to income. And even though a real estate price boom is sweeping much of the country, Dallas’ run-up in prices has made the multiple here higher than in some comparable cities. We’re now a less affordable market than Atlanta, Minneapolis, Oklahoma City, and Kansas City, among others. Prices, supply, density. fees. These are the problems that come with growth. They are, to be sure, good problems to have. But they’re still problems. That’s because of some other “underlying economic fundamentals,” also known as “jobs.” Dallas’ job market has so far seemed immune to the decline in oil prices that has sacked Houston’s economy and hamstrung its housing market. Even as energy has declined, other industries here have remained strong. The Dallas area has posted a 4 percent growth in total employment each year during the current housing run-up. That, well, hot job market here has helped bring new residents. In droves. Along with Toyota North America, 105 other companies have moved to the Dallas area since 2010, according to commercial real estate and analysis firm CBRE. That’s tops in Texas. Today, our area has the leading labor force in the state, with 3.5 million people working here. Partly as a result, more than 100,000 people have moved to the Dallas area each year for the past several years. That’s roughly 300 people moving to this area every single day, all of them in need of a place to live. And as long as the people keep coming and continue to draw paychecks, the hottest Dallas real estate market—ever!—won’t cool off.